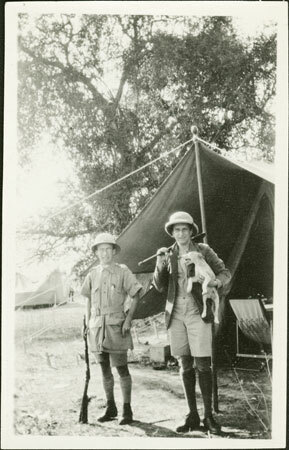 A portrait of linguist A. N.Tucker standing beside Evans-Pritchard, both holding guns and Evans-Pritchard a small dog under his left arm. They are standing outside Evans-Pritchard's tent possibly at Pakur village or Yoinyang. The image was taken for A. N. Tucker by an unknown person. Tucker worked as Linguistic Expert of non-Arabic Languages for the Sudan Government from 1929 to 1931. Evans-Pritchard met Tucker when the latter visited his fieldsite in 1930, after which time he gave him these prints. Note on print reverse ms ink - "Kodak's had the nerve to enlarge this photo" & ms pencil "29"
Morton, Chris. "A. N. Tucker and Evans-Pritchard" Southern Sudan Project (in development). 03 Jan. 2006. Pitt Rivers Museum. <http://southernsudan.prm.ox.ac.uk/details/1998.355.581/>.